In our last tutorial, we understood how to perform Dependency Injection using Annotation, in this tutorial we are going to understand about how to perform Dependency Injection using the Autowiring feature of Spring Framework. Autowiring is a feature provided by Spring Framework which automate the process of wiring the beans in a Spring Project. To perform autowiring of beans, Spring provides us an attribute -autowire. When a class A contains a property/reference of class B and the autowire attribute is set with the byName value on class A bean(configured in xml file), the Spring container looks for the other bean(in xml) of type class B with the same property name and inject it into the class A bean. In the upcoming section, we are going to create a few loosely coupled Java classes also known as beans, configure these beans in a configuration xml file, load and instantiate the beans and perform dependency injection using the autowire attribute value - byName. We are going to create a java class named Company within the decodejava package and this class contains a message info(). Next, we are going to create another Java class named Employee and it is going to contain a String object, a primitive int and an Company reference, hence Employee class is dependent on Company class as it contains its reference. The objects of String class and Company class and primitive int value will be injected into a Employee instance/bean by an automatic call to the setter methods(must have when using autowire="byType") in the Employee class by the Spring Container, when the Employee bean is created by it using the configuration xml file(to be created in the upcoming section). //Setter method is a must when using autowire="byName"
Creates the Employee bean by calling setter methods i.e. setName(), setCompany() and setYearsOfExp, creates the specified Company bean and injects it into Employee bean. Accesses the Employee bean specified in the configuration file by calling the getBean() method of ApplicationContext container. Eventually this class calls the method of Employee class - getName() and getYearsOfExp. In this file, we have configured an Employee bean with a unique id, a String object, a primitive int value and a Company bean is injected into the Employee bean with the same property name as present in the Employee class, using the autowire byName attribute.. The name child attribute refers to the name of a property in the Employee class i.e. name or yearsOfExp. A Company property named - company, is also assigned with a Company object by looking up the bean configured in xml file with the same name - company and by calling the setter method -setCompany, when the Employee bean is created by Spring Container using the bean configuration in config.beans.xml file. 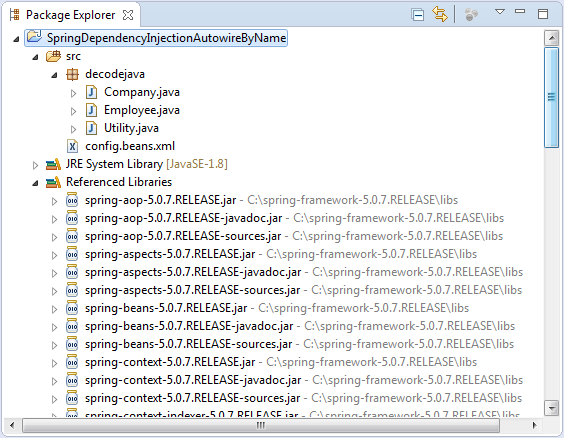 Project Folder - SpringDependencyInjectionAutowireByName is the name of our Project and it is a top-level directory. An POJO/Entity class file i.e. Company.java. A dependent class named Employee.java class, which contains an object of OutdoorSport class. Finally, after executing Utility class, you will get the following output within the Console window. This output shown below, shows how the Utility class has used the ApplicationContext container of Spring Framework to load the configuration xml file - config.beans.xml, access the beans specified in it, instantiate the Company class and Employee class. It also injects a String object, a primitive int value and a Company bean into Employee bean and calls the methods of the respective classes. This concludes performing the dependency injection by injecting a bean into another bean using the autowire attribute value - byName. In the next article, we are going to show you how to perform the dependency injection using the autowire attribute value - byType.